To date, international concern with Middle East refugees has focused primarily on the approximately 700,000 Palestinian Arabs who left Israel during the 1947–48 war. Far less attention has been paid to the nearly one million Jews — known as mizrahim — who left Arab countries in the decade or so following that war. Most moved to the newly created Jewish State of Israel where today they constitute the majority of the Jewish population, and often lean towards the hawkish side of the political spectrum. As with the Palestinian Arab exodus, explanations of the causes of the Jewish exodus are highly contentious given their links with contemporary political agendas. Historically, two polarised views have prevailed. The Zionist or Israeli position attributes the Jewish exodus almost solely to Arab violence or threats of violence, and the Arab or anti-Zionist position assigns responsibility to a malicious Zionist conspiracy. In my opinion, the Jewish exodus is best explained as a complex combination of push and pull factors. The pull factor was the growing influence of Zionism, and the attraction of many Mizrahi Jews after 1948 to the idea of living in Israel. Another factor, which was not specifically about Arab-Jewish relations, was the general Arab post-colonialist resentment of foreigners which led to their gradual exclusion from social and economic life as the Arab countries attained their independence. For example, many Jews appear to have left Egypt because of economic factors such as loss of jobs and livelihood, rather than specific anti-Jewish persecution. Nevertheless, a considerable number of Jews — perhaps the majority — seem to have left as a result of either systematic harassment, or direct expulsion. Some communities felt obliged to leave over time due to ongoing government discrimination and popular hostility. Others were expelled en masse as in the expulsion of 120,000 Iraqi Jews to Israel in 1951. Many experienced outbreaks of serious anti-Jewish violence. It can reasonably be concluded that Jews in the Arab world were driven out as a direct and unapologetic retaliation for Jewish actions in Israel/Palestine. But one of the most serious outbreaks of racist violence took place in Iraq in June 1941. The Farhud (or pogrom) resulted in the deaths of 179 Jews and several hundred injuries. In addition, numerous Jewish properties and religious institutions were damaged and looted. 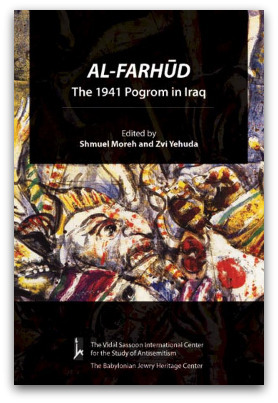 A newly edited book by the Israeli academics Shmuel Moreh and Zvi Yehuda (Al-Farhud: the 1941 pogrom in Iraq, Hebrew University Magnes Press, 2010) sheds new light on the causes of the Farhud. The authors note that the Iraqi Jews were a well-integrated community who could date their heritage back to the destruction of the first temple in 586 BCE. Following the establishment of the modern Iraqi state in 1920, Jews were prominent in professional and commercial life. Overall, Jews viewed themselves as Arabs of the Jewish faith, rather than as a separate race or nationality. Nevertheless, anti-Jewish feeling was reflected in both official and popular actions including discrimination and occasional violence during the 1930s. Matters came to a head with the pro-German military coup of April 1941. The coup leaders were quickly defeated and exiled by a British army occupation, but their departure was followed by the farhud which was perpetrated by Iraqi officers, police, and gangs of young people influenced by religious and nationalist fanaticism. These groups rejected the presence of national or religious minorities in the Arab world, and regarded the Jews as a fifth column sympathetic to the Western powers. The anti-Jewish rioters were influenced by a number of factors. One was ongoing incitement by a group of approximately 400 Palestinian émigrés residing in Iraq. These Palestinians were led by the extremist Mufti of Jerusalem, Haj Amin el-Husseini, who would later collaborate with Hitler's Final Solution. Another factor was the anti-Jewish propaganda distributed by the German Nazi envoy in Baghdad. In addition, there was the cynical political decision by the British Army to delay the timing of their intervention to restore order lest they be labelled as friends of the Jews. The most significant finding from the many Jewish memoirs cited in this text was their terrible sense of betrayal. Many of the killed and injured were attacked by local Muslims whom they personally knew. Others gave jewellery and money to their neighbours in trust who then refused to return the property. But conversely, many recalled with gratitude the bravery of their Muslim neighbours who acted to save their lives. Today, the Jewish refugees are increasingly demanding recognition of the injustices they suffered. They definitely do not want to return to the Arab countries, but they want some form of compensation or redress for their loss of homes and livelihood. Both the Israeli Knesset (Parliament) and the US House of Representatives have passed motions (in 2010 and 2008 respectively) demanding that the Jewish refugees from Arab countries be granted the same rights as those of Palestinian refugees. In my opinion, the two exoduses are not identical in motivation and cause, and should be considered separately. However, I do believe that the Arab League would make a significant contribution to Israeli/Jewish-Arab reconciliation if they formally recognised the positive role that many Jewish communities previously played in Arab life and culture, and apologised for the intolerance that turned them into refugees. Associate Professor Philip Mendes teaches social policy and community development at Monash University. One hopes that a suitable accommodation can be found between Jews and Palestinians, ultimately leading to a one-State solution. David, I don't think Philip is in favour of a one state solution. Philip, the Arab League is not the aggressor in this awful situation. They have simply reacted to the actions in Palestine, believing they stand in solidairty with the ones they identify with more closely, ie their Semitic Arab brothers and sisters. It is unfortunate that Jews living in Arab nations were tarnished by the actions of Jews who entered and still occupy Palestine. The reality is that this happens too much around the world. Ironically, Jews all around the world claim to be victims (even by association) of the Nazi campaign in Europe. I agree it is important to remember the discrimination and/or persecution of Arab Jews that has occurred and still may occur. The Arab world has a lot to answer for adding fuel to the fire of anti-Semitism. Long-term plans for peace will require some acknowledgment of past mistakes as well as future guarantees for people regardless of race, religion etc. That is not to deny the discrimination and persecution of Palestinian Arabs by the events subsequent to 1948. That is not deny the anti-Arabism and Islamaphobia that is occurring within significant sectors of the Jewish-Israeli community today. This article also raises the question of right of return and/or compensation for both people's for Palestinian Arabs and Jews. My hope is that we will see leadership strive to protect the rights of minorities a task which will inevitably protect the rights of us all. The British worked with the Jewish leaders and were instrumental in setting up Israel as a Jewish State. Do you also endorse compensation to the Palestinians for the bombing of their families and homes by Israel. Israel is illegally occupying Arab territory. Palestine is like the stone-throwing David,the Israeli army with their superior weapons is an unjust Goliath, while doomsday christians await the 2nd coming when the Jews own all of Israel. This is genocide and the Jews ought to know better. In May 1948 five Arab League members went to war against Israel. Jews don't want to return to Arab countries - they want recognition that they were driven out as refugees. This word is brandished far too often to label opposers of Israeli politics (including State sanctioned murder), and paradoxically aims to arouse sympathy in people for the plight of all Jewish people. Bataween, this article was about recognition of Jewish refugees from certain Arab communities after 1948. But if you are going to now focus on the war of 1948 and assign blame that is another thing. Far from being the aggressor the Arab League as has been pointed out stood in solidarity with Palestinian Arabs who since the time British occupation forces arrived in Palestine had sought self-determination. Most people will be surprised to learn but the UN Security Council effectively suspended the GA (non-binding) Partition Plan in March 1948]. In April-May the Security Council reconvened a special session of the GA to consider a UN Trusteeship proposal for British-mandate Palestine. However the Jewish Agency rejected this and unilaterally declared a state on 14 May, despite the UN GA's reconsideration of the issue. Cold War politics helped Russia and the US quickly recognise Israel. Israel was rejected recognition by the Security Council in 1948 and had to wait until 1949 to be accepted on the condition it accepted resolution 194 ie right of return for Palestinian Arabs. This never happened. Damien, bit rich given the whole Palestinian narrative is that they were innocent victims. Never mind in 1947-1948 they were responsible for the death of 2,000 Jews - roughly equivalent to Israel killing 10,000 Palestinians today. Never mind that they kicked off the fighting in 1947 that lead to them losing that war. Never mind that most of 1948 Israel wasn't private land and the land that was privately owned was mostly owned by absentee landlords. They are the eternal victims, which is one of the main reasons they don't have a state because being a victim is better than not being one - and for the PA, Hamas and UNWRA much more lucrative. Stewart Mills, the arab league made an unprovoked attack on a neighbour. The idea that it was "for the Palestinians" is simply laughable. One only has to see the treatment of the people they were "in solidarity with" in Jordan - the best place - and Lebanon, Syria and Egypt. Indeed one can compare them with the treatment of Israeli Arabs. Secondly, 194 doesn't say there is an unconditional right of return. It talks about rehabilitating and integrating the refugees who don't want to live in peace with Israel. So the Arabs would be in "violation" of this resolution more than Israel, which is probably why they all voted against it. Israel was rejected for membership of the UN because of the British veto which is understandable given their FM's views and the fact that 3 of the 7 armies fighting Israel were puppets of the UK. Carol, year on year the number of Palestinians under Israeli control has gone up. Want to name a genocide where there are more of the victims during it than before it? The British armed and financed 3 of the 7 Arab armies that fought. They imposed an arms blockade on Israel. The blocked 150,000 Jews coming to Israel. They were running and commanded the Arab Legion - the only Arab army to make significant gains against the IDF - and they militarily intervened in Jan 1949 to stop the IDF wiping out the Egyptian army. They also tried to block Israel's international recognition as indirectly pointed out above. It is a truly heroic revision of history to claim they sided with the Jews. The Jewish refugees from Arab countries, partly due to terror orchestrated by Israel such as the Lavon affair, can demand the right to return to their countries. We should support the campaign for the Jewish refugees to rturn to their countries. If the Jewish refugees are demanding the right to return and resettlement in the countries, we should support it. Many of us will wish the new government well, but refrain from putting our own money on its survival. Hopefully our two major parties, which were so happy to do whatever it took to win, no matter what the cost to human lives and ethical values, will recover a deeper sense of what matters.